Israel has long had a rather chauvinistic, but nevertheless true saying loosely translated as “the best men become fighter pilots and the best women become fighter pilots’ wives”. The Israeli Air Force has been at the forefront of Israel’s defense since the very early years of Israel’s independence and ever since then it has enjoyed an unassailable status as the finest such force in the Middle East and among the finest anywhere in the world. There can be little doubt that without Israel’s nearly insurmountable air superiority, the defense of the country against its many enemies would have been all but impossible. The glorious victory in the 1967 Six Day War and the daringly successful 1976 raid to free the hostages held by Arab terrorists in Entebbe could not have been possible without one of the world’s best equipped and best piloted air forces. It is a small surprise then that in Israel fighter pilots enjoy a near god-like status and being a pilot’s girlfriend or wife is an immediate status upgrade as well. The stunningly beautiful Ayelet Shaked, Israel’s minister of justice and co-leader (with Naftali Bennett) of the new “New Right” party is married to a recently retired F-16 fighter pilot. She is also a computer engineer and, obviously, a highly accomplished woman on her own right. As such, she embodies everything that Israeli womanhood is all about. It is unabashedly feminine, but not feminist. It does not pose the false choice of family vs. career: Shaked, like many Israeli women, is a wife, a mother, and an accomplished professional with a brilliant career. And most of all, she is brave. When the creative team of her new party brought to her an idea for a promotional video clip in which she would use the full extent her feminine charms to “sell” a (needless to say, fake) perfume called “Fascism”, she naturally declined. But the creative team persisted and it was agreed that the clip would be filmed at the luxury Tel-Aviv home of Number 3 in the New Right party Alona Bareket, who is a very wealthy businesswoman. It was agreed that the clip would not be released without Shaked’s express approval. The intent behind the clip was rather radical and not only because of the use of the party co-leader and a current government minister in the role of a sexual seductress. The intent was radical because it took on, it frontally attacked, the progressive left’s most potent weapon: their monopoly on defining who is and who is not “fascist”. The left, both in Israel and in the rest of the Western world has (mis)appropriated to itself the terms “fascism”, “racism”, and all other synonyms for racial, sexual, or religious bigotry and declared itself their sole guardian and owner. Then, it proceeded to weaponize these terms against its political opponents and simply anyone and everyone whom they did not like. You can bash in other people’s heads with bike locks because you disagree with them, but you are not a fascist. Should you dare wear a MAGA hat on your own head however, you are definitely a fascist. The Left has been playing this game for a long time and with great effect. The extreme reluctance most people feel to be branded fascists or stuck with any other such label has disarmed many a conservative, especially outside of Israel, but also inside it. Something had to be done. It is amazing that this something fell to an Ashkenazi Jewish woman and mother, a person who embodies in her person all of the six million and more victims of real fascism. 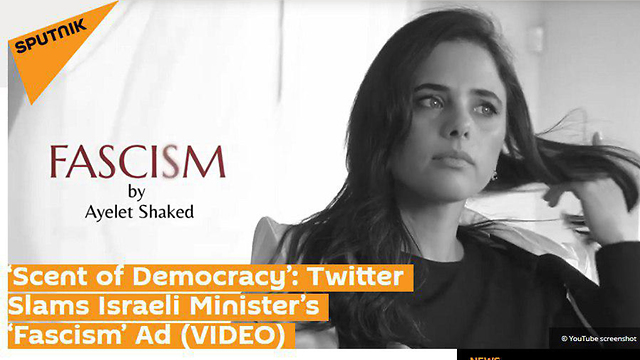 By spraying herself with the “Fascism” perfume, Shaked is saying to the radical Left, the Marxists, the Jew haters, the anti-Zionists, the Omars and the Tlaibs, and the their counterparts in Israel, to all the real ideological descendants of the Nazi Fascists of 70 years ago, “I am not afraid of you. I am on to you and your dirty little tricks. Your labels do not stick to me and you know exactly what you can do with them”. The clip was made and Shaked agreed to release it. 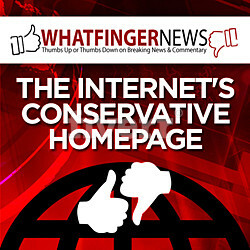 You can watch it here and see for yourself. Judging by the snarky, panicked reactions by neo-fascist organs like The Guardian calling the clip a “PR disaster”, it has landed right on target. I am an Israeli living in exile and as such I cannot vote in Israeli elections. When I lived in Israel, I cast all my votes for the Likud party and until now that’s what I would have done again, had I had the chance. But not anymore. By agreeing to shoot and release this clip, Ayelet Shaked showed me that she is fearless, that she knows who the real enemy of the Jewish people is, and that she is not afraid to take that enemy on and win. 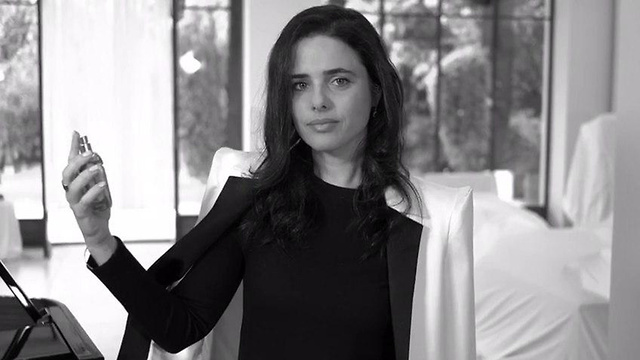 Today, I am all in for the New Right, I am all in for Ayelet Shaked, and I hope to see her one day, when Benjamin Netanyahu decides to take his well-deserved retirement, in the prime minister’s office.